All education sessions. All products. All industries. Customers, partners, employees—all in one location for 2½ days of learning, sharing and networking. 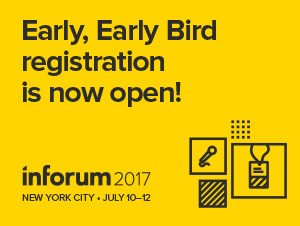 Register before January 31 to get the early early bird rate and join us at the Javits Center in New York. For details see the Inforum 2017 website. This entry was posted in Tips on December 9, 2016 by Karin Portillo.